Yaletown is one of those Vancouver neighbourhoods that actually live up to the term “fun and funky.” Cobblestone streets, chi-chi loft-style condominiums in what were once old warehouses, boutiques, galleries, plus an eclectic mix of what can only be described as “characters.” All in all, a perfect setting for a night sipping some of the more unusual wines from the South World. The event was the monthly (well, more or less monthly) tasting put on by our eclectic group of South World Wine Society enthusiasts. 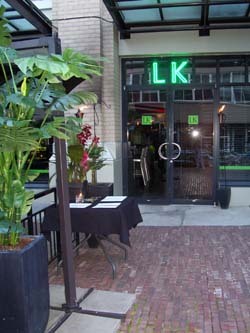 We met at the LK Dining Lounge, a trendy Latin American restaurant one patron described as “deliciously drool-inducing.” Paul Watson, our illustrious cellar master, had obviously taken great delight in pouring wines that ranged from difficult to impossible to find plus a few varietals almost no one in the room had heard of. The reception wine was Pascual Toso Brut N/V from Argentina. A crisp, dry blend of Chardonnay and Chenin Blanc, this sparkler is a deal at about $16. Made in the traditional style, it’s got the great yeasty nose we both enjoy. Yes, we’re both thinking oysters – again. What can we say, some things never change. 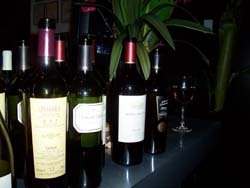 The two other whites of the evening were a 2006 Bouchon Sauvignon Blanc (Chile) and a 2006 Norton Torrontes (Argentina). All at our table agreed the Sauvignon Blanc had good acidity and went well with the Tomato-Basil and Green Olive Tapenade Bruchetta that was the evening’s first culinary creation from Chef Travis Williams. More in the South African style, there’s no hint of the cat’s pee or gooseberry of a New Zealand Sauvignon Blanc here. But it was the Torrontes that seemed to hit everyone’s nose and palate with a delightful “Ahhh.” Floral and perfumey, hints of apricot or for some the whole Okanagan fruit stand, most of us kept coming back to this glass just to inhale the aromas some more. Several said it reminded them of a Viognier, for others it was Gewurztraminer, and there was a brief rumbling about Riesling as well. According to Oz Clarke’s Encyclopedia of Grapes, Torrontes “can be positively heady and beautifully refreshing.” He does caution, however, he’s never found one that ages well beyond two years and suggests it’s better to drink within a year. So this is a problem with a wine this much fun? Making a debut as the first Uruguayan wine the society has ever poured, the 2004 Pisano Tannat got mixed reviews. We agreed it was a wine that cried out to be served with red meats, although the comment was also made “I keep waiting for it to do something definitive and it just isn’t.” Tannat represents a third of Uruguay’s wine production. Our final three wine were all Malbecs – one blended with Bonarda, two 100%. The winner at our table, and overall the second most popular wine of the evening, was the 2005 Vinas de Balbo Malbec/Bonarda, a 30/70 blend unfortunately not available locally. We agreed that, just like a good Beaujolais, this is an almost quintessential picnic wine – bring on the cold cuts, finger food, and a red checkered blanket. Not surprisingly, the particularly excellent Cordero Costrada a la Hierba (grilled, herb-crusted lamb chop, cilantro chimichurri) simply packed too much flavour punch to balance this wine, but the Camaron (coconut-crusted prawn, sweet red chile dip) worked admirably. Although we had trouble locating a few of these wines on the web, we did find a good resource for listings of Argentinean vineyards at www.argentinewines.com/bodegas/bodegas.asp. 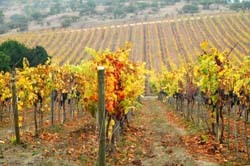 This entry was posted in Bonarda, Carmenere, Malbecs, South American wine, Tannat, Torrontes and tagged Argentina, Chenin Blanc, Chile, Malbec, Matetic, Oz Clarke, Pinot Noir, Sauvignon blanc. Bookmark the permalink.